Sunday started with a roar from the skies as the anticipated rains came howling through with lightning and thunder. The hazardous conditions of large amounts of standing water and lightning forced ROK Cup Promotions to make the call for a three and a half hour delay, eliminating pre-finals. Morning warm-up began with a drenched circuit, but the rain had stopped and the track began to dry out with every passing kart. Although grip levels had dropped due to the storms, the main events went off exactly as planned with a dry circuit. In total, 219 entries made the first round of the 2019 Florida Winter Tour an exciting event to kick off the newest season of ROK events throughout the country. The 1-2 finish gives the refreshed brand a huge start to 2019. In their first true team effort at the Florida Winter Tour, Croc Promotions USA came in and put the Mad Croc brand under the spotlight in Shifter ROK with AJ Myers (Croc Promotions USA / Mad Croc) and Andrew Bujdoso (Croc Promotions USA / Mad Croc). Both drivers took part in leading the 18-lap final, but Myers ultimately got around Bujdoso late in the race to take the win over his teammate. The holeshot belonged to Danny Formal (Leading Edge / Formula K) who had won two of the three heat races coming into Sunday. However, Formal and Myers tangled late on lap one with Formal later claiming a stuck throttle that would send him down the order, as far back as seventh. Out front, Bujdoso now led with Myers in second, followed by Mathias Ramirez (PSL / BirelART). The BirelART driver was the driver on the move having started seventh and was now closing on the leaders as they approached the halfway mark. Myers and Bujdoso battled for the lead into turn 10, allowing Ramirez underneath for a three-wide race to turn 11 that positioned him in second behind Bujdoso. On the ensuing main straightaway, the opportunity for Ramirez to take the lead presented itself as he flew around the outside of Bujdoso, who looked to be defending into the turn one/two complex. Ramirez and Bujdoso touched tires, launching the rear of Ramirez into the air, losing most of his braking ability and hitting the outside wall. Although still able to carry on, Ramirez had dropped outside of the top-15. Just a few laps later, Myers got inside of Bujdoso and the rest was history as the two Mad Croc teammates drove comfortably out front. Formal was able to rebound back to third, completing the podium and giving him more than enough points to keep himself in the fight when we come back to Miami in four weeks. Robert Bujdoso (Checkered Flag Motorsports / GP) and Henry Cubides (Envia Racing / Tony Kart) finished a distant fourth and fifth. Ramirez was able to climb back to thirteenth after his spill. An unblemished opening weekend has the Californian as the championship favorite. Despite not having any previous experience on the Vortex ROK GP engine platform or the Orsolon Racing team, Christian Brooks could not have had a more impressive weekend. The Californian ran uncontested at the front of every session of Senior ROK, turning in a perfect scorecard and topping it off with the flag-to-flag victory in the 18-lap final. The opening laps saw Brooks turning laps more than a half-second faster than the field, opening a 1.5-second advantage before the end of lap three. From there it was cruise control for the Americas Rallycross (ARX) driver, crossing the finish line more than three-seconds ahead of Arthur Leist (PSL / BirelART) in second. Starting the race from outside pole, Leist lost that position to Nicholas Hornbostel (REM / Kosmic Kart) on the opening lap, only to retake it a few laps later. The Canadian looked to miss the mark on setup, falling down the order as the race wore on, but rebounding to finish third in a close battle with Sebastian Montoya (Team Montoya / Tony Kart). 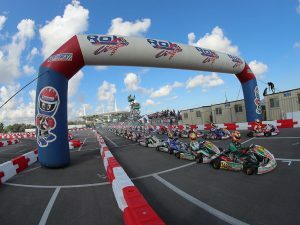 Arias Deukmedjian (Leading Edge / Praga), who missed all of Thursday free practice with school obligations, finished fifth in his first Senior ROK start. A wild last lap had Crews climb three spots, pushing back his bumper in the process. The first 17.5 laps the 18-lap Junior ROK Final were led by pole sitter Luca Mars, who had come under attack on multiple occasions, but had never relinquished the lead as the leaders made it to the final lap. At this point the gloves were off and Diego Contecha (Orsolon Racing / Tony Kart) and Brent Crews (Nitro / Kart Republic) wanted the top spot. With Mars defending, Contecha used some bumper to try and move the Pennsylvanian, unsuccessfully, in the turn four hairpin. Directly behind was Crews, who had now made it into third with a pass on Lucas Staico (Orsolon Racing / Tony Kart). As the lead three made their way into the turn five-six double-left, Contecha again pushed Mars unsuccessfully, but it was enough to leave room underneath for Crews to snake his way through, past both drivers, to take the lead as they exited turn six. Unfortunately for Crews, his bumper had already been pushed back in a similar situation laps earlier and he would be charged a five-second penalty in post-race tech, handing the win to Mars. More penalties to teammates Staico and Contecha promoted Canadian Mackenzie Clark (Prime Powerteam) to second. Compatriot Justin Arseneau (Speed Concepts / Tony Kart) benefited as well to get into the final podium spot. Chloe Chambers (Mike Doty / Kosmic Kart) had her best run of the weekend to finish fourth ahead of Staico after his three position driving penalty. The Supertune USA cadet driver made a big statement at Florida Winter Tour Round 1. In a category that often times comes with multiple weekend winners and races down to the final corner, it makes it that much more impressive when a weekend belongs to a single driver. This weekend belonged to Kai Sorensen (Supertune USA / Tony Kart) from Lodi, California. After posting fast time on Friday, the 2018 Mini ROK Vice Champion went on to leave no doubt he’s here to take the championship and earn his place on ROK Cup Team USA in Italy in October. Perhaps as impressive as Sorensen’s drive out front, Jack Jeffers (Orsolon Racing / Benik) made it all the way to second place after a qualifying run in 27th. Passing 49 karts in 21 laps of heat racing, Jeffers started the final in ninth before making his way to the second step on the podium. The Texan can now only wonder what could have been if the gremlins didn’t find him in qualifying or a cancelled pre-final that could have propelled him even further up the grid to start the final. Nikita Johnson (AKT / Energy) and Miguel Costa (MC Racing / Parolin), third and fourth, were two other favorites coming into the weekend who may have just missed the mark with their expectations as they had hopes of a win to start the year. Caleb Gafrarar (PSL / BirelART), in his first Mini ROK start for PSL Karting, battled from 15th to fifth and turned in the third fastest lap of the final. A rival breaks at the start, opening up clear track for the RPG driver’s massive win. From start to finish, Victor Jimenez (RPG / OTK) controlled the race in Shifter ROK Master, driving to a three-second victory that honestly felt even more comfortable than that. After a disappointing end at ROK the Rio last November, Jimenez bounced back in a big way to take a comfortable lead in the category’s championship. Drama unfolded immediately in the Shifter ROK Masters final when Patrick-Otto Madsen (Ansa Motorsports / Zanardi), Jimenez’s nearest rival, had gearbox issues as soon as he stepped on the gas. A gaggle of karts went swerving in every direction to avoid a major collision as Madsen’s kart came to rest about 20 yards from the starting line. The pole sitter on Friday found his race was over as soon as it started. Luis Schiavo (Goodwood / Intrepid) made it through the melee and came out the other side in second, matching his best result of the weekend when it counted the most. Daniel Dibos (IC Motorsports / OTK) and Patrick Licciardi (Team Midway / FA Kart) fought closely for third with Dibos getting the better of the two. Rene Martinelli (TB Kart USA) launched into the air to start the race during a chain of events that were set off by Madsen’s false start, but kept going to finish fifth, setting the second fastest lap of the race. The Brazilian-American picks up where he left off from Las Vegas. It was another impeccable weekend for Renato Jader-David in the Master ROK category. The 2.5-second win gives the Brazilian-American two Master ROK wins in a row dating back to the ROK the Rio finale in November. With three heat race wins, it also gives the Orsolon Racing driver five of the last six heat races and two straight pole positions as well. Felipe Rechid-Lapenna (CRG) turned in his best performance of the weekend when it counted the most, finishing second by three seconds over Leonardo Marcelli (Piquet Sports / CRG) who finished the podium in third. Ricardo Nunes (DRT / DR Kart) and Christian Saa (AM Engines / Exprit) finished a distant fourth and fifth, respectively. An early fight gave way to a comfortable victory for Beckham. 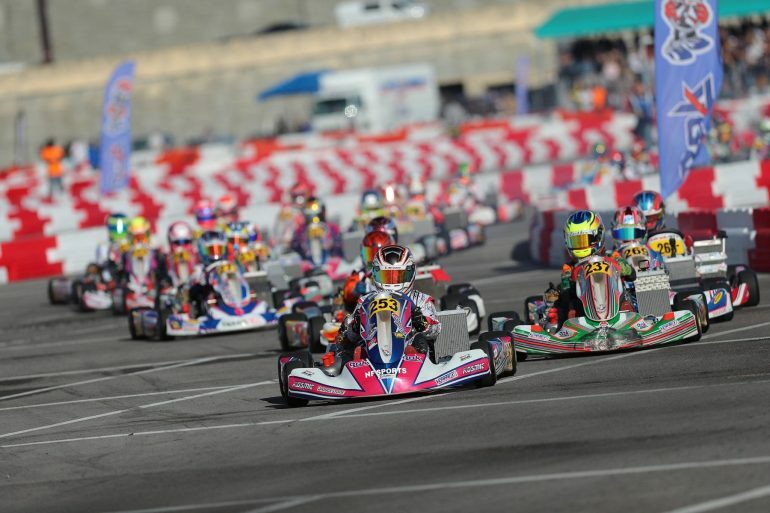 Newcomer to the Florida Winter Tour, Jacir Beckham took the win in Micro ROK in convincing fashion for JC Karting. The South Floridian captured the pole position on Friday, won a heat race on Saturday, and started from the top position on Sunday before taking victory by over five seconds in the 15-lap final. Matias Orjuela (Vmotorsport / Parolin), winner of the first heat on Friday, had made for an exciting fight with Beckham in the early going, but a retirement just past halfway ended the only competition Beckham had. Enzo Vidmontienc (International Motorsports / Benik) took over the second position as he cruised all alone to the silver medal. Salim Hanna (Team Montoya / Tony Kart) gained five positions to make it to the final box on the podium ahead of Jordan Di Leo (Goodwood / Intrepid) and Karsyn Walters (Supertune USA / Tony Kart). A final lap scuffled set the outcome of the 100cc Junior final. It was continued improvement for the Northeastern driver, Chloe Chambers (Mike Doty / Kosmic Kart), throughout the weekend. From her fourth place qualifying effort all the way to the win on Sunday, the Mike Doty Racing driver put in the work to earn the win on the final lap of the 18-lap feature. In typical 100cc fashion, the race from start to finish was back and forth. Chambers and William Cox (Team Felon / Tony Kart) swapped the lead on multiple occasions. On the final lap, the two went into the turn four hairpin side by side, making contact, which resulted in Chambers to the lead and Cox back to a distant third. Chambers would hold on over Adam Maxwell on track as the checkered flags flew. Maxwell was in the fight throughout the main event, but never could get himself close enough to interrupt the top-two position. A penalty was handed down in post-race tech for a pushed in front bumper, knocking the Midwestern driver back down to third, promoting Cox to second. 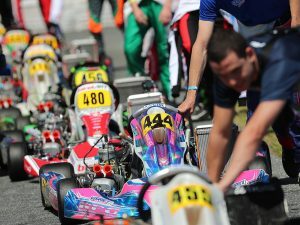 Santiago Biagi (AM Racing / Exprit) and Marcos Telle (JC Motorsport / Tony Kart) finalized the top-five. Prior takes the win in Senior, Savaglio in Junior. Jordan Prior (Prime Powerteam / BirelART) emerged victorious in the hotly contested Briggs 206 Senior category. 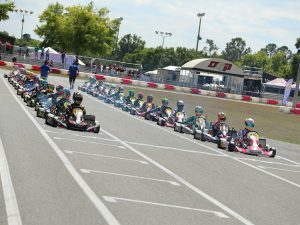 At times during the 15-lap final it was a six kart gaggle at the front, but Prior and Zachary Linsell (MGM) were able to breakaway as the race wore on. By just .120, Prior edged Linsell at the stripe, followed by Mickael Aubin (PSL / BirelART). In Junior, the 360 Motorsport team from Canada swept the podium with Gianluca Savaglio, Nicky Palladino, and Carsyn Massey, all aboard the Intrepid chassis. Savaglio, who didn’t record a time in qualifying, climbed 14 spots in his first heat race to win as the rest of the field took notice. Starting from seventh, Savaglio again carved his way to the front by a mere tenth of a second over his teammate.